With about 25 million seahorses sold each year, global consumption of seahorses is massive. They’re used in traditional Asian medicine and also sold as curios and aquarium pets. Over the last decade, overexploitation and habitat degradation have prompted declines of between 15 to 70 percent in many seahorse populations. The biology and lifestyle of seahorses make them particularly vulnerable to overexploitation. For instance, they have a low birth rate compared to fish, which slows population recovery. While cod may produce 200,000 eggs at each spawning, a seahorse pair typically yields 1,000 young annually. Seahorses also mature slowly. That means that, because juveniles are preferred for home aquariums and medicines, they are often removed from their habitats before they reproduce. In addition, because they move slowly and tend to remain in one location, seahorses are easy targets for fishermen. Seahorse habitats, too, “are doing pretty badly globally,” Scales notes. Coral reefs are threatened by climate change, overexploitation, destructive fishing practices, increasing coastal populations, pollution, sedimentation and coral bleaching. A recent report of the Global Coral Reef Monitoring Network estimated the world has already lost 19 percent of its coral reefs, with 15 percent more seriously threatened over the next 10-20 years and another 20 percent under threat of loss in 20 to 40 years. Seagrass meadows face similar pressures, with typhoons, runoff, destructive fishing, coastal construction, and pollution contributing to their destruction and degradation. In the Chesapeake Bay, for example, 90 percent of natural seagrass beds have disappeared over the past 50 to 100 years and, in Vietnam, about 50 percent have been lost over the past 20 years. In the following interview, Scales discusses the threats to seahorses and what you can do to help. Helen Scales, PhD, is a marine biologist, writer, and broadcaster. She has lived and worked in various countries and specializes in fisheries, habitat protection, and the international trade in endangered species. She now lives in Cambridge, England where she works as a consultant for a number of conservation groups including the International Union for the Conservation of Nature, Natural England, and TRAFFIC International. She also appears as a radio host on the BBC’s The Naked Scientists show and on BBC Radio 4’s Home Planet, and produces and presents a new podcast series, Naked Oceans, a fun and informative exploration of the undersea realm. Her first book, Poseidon’s Steed: The Story of Seahorses from Myth to Reality, explores humankind’s thousand-year fascination with seahorses. Laurel Neme: What are the threats to seahorses? Helen Scales: There are many different things for seahorses that are threatening them globally now. Like many marine species, seahorses face global problems of changes in their habitat (such as seagrasses and coral reefs and mangrove forests and so on). These habitats are doing pretty badly globally. Seahorses face a number of threats from things like climate change. We’ve got problems when the sea temperature rises. Then coral bleaching takes place, where the algae that live inside the tissue of the coral animals that make up reefs can abandon them, leaving them all bony and white. That will often kill [the reefs], and if that happens in areas where seahorses are living, then the seahorses habitat is gone. They can’t really do well without those habitats to hold onto to live in. It’s the same with seagrasses. They are a threatened habitat because of coastal development and things like that. So, habitat loss and degradation is a big problem for seahorses and many other species that live among the site. Seahorses are [also] threatened by overfishing. 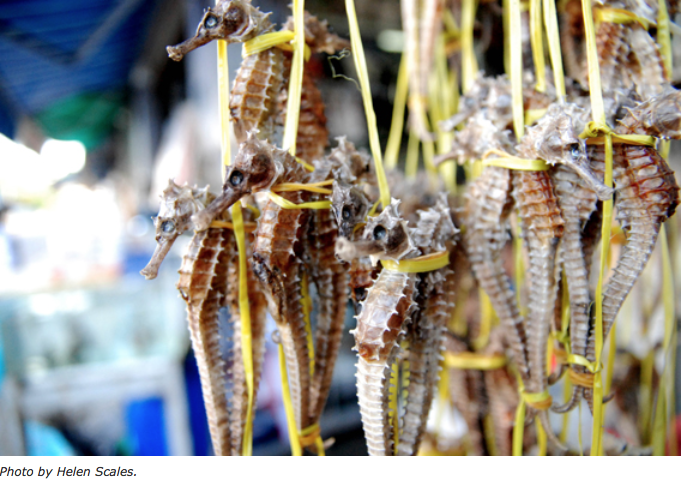 We might imagine that no one would want to eat a seahorse. Certainly these little crunchy guys wouldn’t seem that appetizing. People do eat them a little bit for food but mostly the threat to them is because for hundreds of years they’ve been used for traditional medicine across Asia, and this continues to be the case today. Increasingly we’re seeing millions of seahorses – we think as many as at least 25 million a year – being traded internationally. That figure is quite vague, because it’s not something that’s being monitored very closely. It’s something we’re still trying to get a handle on. Seahorses are caught partly by directed fishing, in countries where artisanal fishing still keeps going. In some cases, like the Philippines, the fishermen will swim down and go snorkeling and they will find seahorses, pick them up by hand, and take them away to be sold in the medicine trade. But that’s something that’s never going to be on a huge scale. 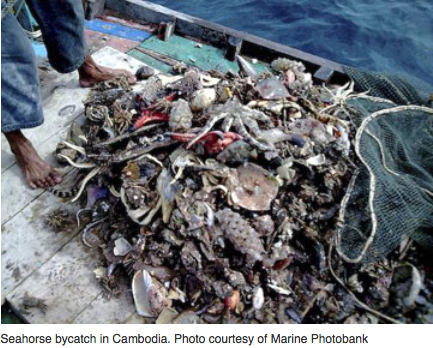 The really big problem for seahorses is trawling. The problem is that they live in the same as shrimp, which people do like to eat. When you go trawling for shrimp in habitats like seagrasses and coastal areas, because they live in similar areas, seahorses get caught at the same time. A few decades ago, those seahorses may have very well been thrown back because at that stage the international trade in seahorses hadn’t really got going. Even so they were probably dead by the time they went back into the sea, but there was a chance that some of them might have survived. But nowadays fishermen all around the world – in the Caribbean, across Asia – if they catch seahorses, they will keep them and they will sell them for medicines because they can make a lot of money out of it. It’s a way of getting some extra income. Seahorses may not be what they were after, but if they catch them, they’ll sell it because they can make some good money out of it. That is a big threat to seahorses, and it’s something that’s going to be a real challenge to try and deal with and to try and come to some kind of point where we can manage it maybe a bit better than we are at the moment. Laurel Neme: What kind of medicines are seahorses used for? Helen Scales: Seahorses have all sorts of applications. It’s mostly in Chinese traditional medicines, but also in variations of that medicine, in Indonesia, Japan, and various other Asian countries. There are all sorts of conditions that seahorses are prescribed for – everything from broken bones to asthma to bronchitis. There is an Indian recipe for bronchitis involving seahorses and honey for children. There are all sorts of concoctions in which seahorses are used. Worryingly, I think because there is really no evidence for this at all, they’re used as an aphrodisiac – nature’s form of Viagra. This is something that goes back centuries in the Chinese traditional medicine trade. I was in a Vietnam doing research for my book [Poseidon’s Steed] and I saw many seahorses being sold tied together in pairs, even though sometimes they have them two males or two females, and they sell those as being particularly potent if you’re in need of a bit of a “pick up.” The worrying thing, I think, for any of these medicines is that they’re being used more and more by these increasingly wealthy middle classes. For example, in China demand is definitely going up. Seahorses are not cheap. Some of the bigger species individuals can sell for fifty dollars or so, which is quite a lot of money. Of course, where there is demand, people will go out and try and meet that by finding seahorses for people to buy. Laurel Neme: Do the medicines work? Helen Scales: Whether or not any of those traditional medicines actually work, that’s also something that we haven’t really got a great handle on. Not many tests have been done outside those traditional spheres. Science hasn’t really gone out and tested if seahorses have these effects. But what we’re aware of is that there is not a huge amount of evidence. I would argue that [whether or not they work] is irrelevant. Even if tiger bones or seahorses or any of these endangered species really do have miracle curative properties, I don’t think that’s an excuse to go and catch them anymore. If they’re a miracle cure we should figure out why, and figure out a scientific way around that. It shouldn’t be an excuse for still going out and catching them as many as we can. We don’t think that’s justifiable in this day and age. Laurel Neme: Is it legal to catch and sell seahorses? Helen Scales: It is. Some national legislations are coming up in various countries that are trying to curb the capture of seahorses and protect them. For example, in the UK, the two species of seahorse that live in our waters natively are now protected under national law. Even the habitats are protected. Hopefully that will translate into these species not being affected too much. But, obviously, the [real challenge is in] the countries closer to the consumers that are in more trouble. There are various national laws that try and restrict the impact on seahorses. At the international level, a few years ago seahorses were included on the appendices of the Convention on International Trade in Endangered Species (CITES). That’s a convention that essentially aims to monitor and control the international trade in those species that are really being put in danger by the fact that we’re using them as pets, as medicines and all these kinds of commercial things. Seahorses became one of those species in which trade remained legal, but only if a country that was exporting it could prove that the trade isn’t causing a detrimental impact on their populations. This is technically now what should be happening. What we’re seeing now is still really working towards being able to get a handle on that, because we’ve talked about how rare seahorses are and how difficult they are to find. Doing a study on what impact a trade is going to have on that population is not an easy matter at all. A lot of countries are having trouble getting a handle on how to measure the impact of their trades, let alone to decide if it’s sustainable or not. But at least I think we’re have steps in the right direction towards thinking more carefully about how many seahorses are being traded and which countries have been trading them the most. 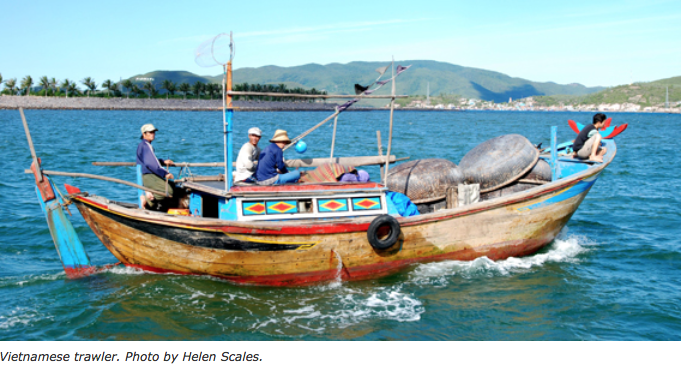 [That way] we can work towards an ideal situation where we can have a sustainable fishery. Laurel Neme: Do we even know how many seahorses exist? Helen Scales: I don’t think we do. Again, it’s a real tricky one. Generally, that is a big part of the question mark as to whether or not a certain number of seahorses being traded is sustainable. If you don’t know how many you had to start with, how can you say a 1,000 or 10,000 or 100,000 are going to be sustainable. We could get a general idea of the density of seahorses (as I said it’s pretty low – maybe one or two for a tennis court) and then maybe multiply that up by the amount of habitat you have, but in terms of a census of seahorses that hasn’t really been done yet. Laurel Neme: Are seahorses also used in the aquarium trade? Helen Scales: Yes, that’s another big place that seahorses end up: the aquarium trade – at least in the past. It’s less so now. Obviously, seahorses are wonderful creatures. Seeing them is such a great thing, and I wouldn’t want to deny anyone who wants to see them in an aquarium. I’ve enjoyed them in public aquariums. But the encouraging thing now is that, instead of having to take seahorses from the wild to put in aquariums, we’ve gotten really good at keeping them and breeding them in captivity. The technologies and the understanding of how to keep seahorses happy, have those males and females make those mating pairs and produce more seahorses in captivity, has come so far, even in the last decade, that now there’s almost no excuse to have a seahorse in captivity that wasn’t itself born in captivity. There are seahorse farms that are rearing seahorses and doing really good work to help promote the sustainability of the trade and to make it treading very lightly on those populations in the wild. That’s very encouraging because I think everyone should see seahorses. Even if it’s just from behind glass in an aquarium, it’s a wonderful experience. I think it really makes people engage with these creatures and then think about where they came from; their wild cousins. It brings us back to thinking about the oceans and everything else that goes on, and why the oceans are so important. If I had more money and more time I might keep seahorses myself maybe. A lot of people keep them at home as pets now, and, you know, why not? It’s no more cruel than keeping any other kind of pet at home, especially seahorses which don’t swim very far in the sea. You’re not restricting it very much; I figured it might be quite happy sitting in a tank. But they take a lot of looking after. I’ve spoken to many people who keep seahorses and seahorses are quite choosy about their water conditions and the food they eat and so on. But the farmed seahorses are much better at staying alive in their tanks than the wild ones, so I think you’re better off buying farmed seahorses anyway. If you’re going to keep them, ask where they came from, and absolutely insist that they come from a reputable farm, and then you can’t go wrong. Laurel Neme: How do you even tag a seahorse? Helen Scales: You’d think that would be tricky. There are a couple of ways that people have come up with. One is by putting a teeny tiny necklace on it – a tiny piece of monofilament, elastic thread around its neck with a tiny dog tag, with a little number on it. Before putting them on wild seahorses, researchers spent a lot of time putting them on seahorses in captivity to check the creatures were okay with it. That the tags didn’t upset them and that the seahorses didn’t get themselves tangled up or anything. It seemed they were fine, so that’s been deployed on wild seahorses, and they stay on. Another way is by injecting little dots of dye into their skin. Some people object to this because it’s more hands on. You have to catch a seahorse and take it up to the surface for a few minutes and inject this dye into their skin, so you can make little patterns of a few spots to identify them. There’re some people who don’t like that approach, but I think it’s probably fine. It’s the kind of thing we do on various different animals when we want to try and track them individually. So, that’s also a possibility, but you’d need to know what you were doing to get that right. 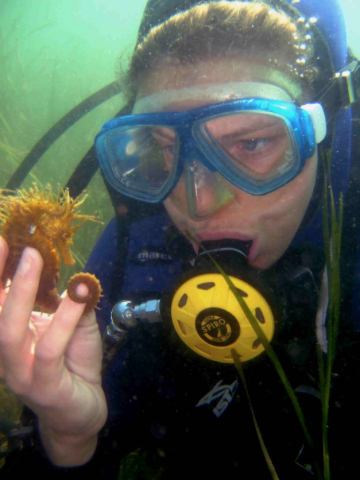 Laurel Neme: What can people do to see or learn more about seahorses? Helen Scales: There are all sorts of ways of experiencing seahorses. There are some really wonderful seahorse exhibits opening up in aquariums around the world. …They’re great places not only for seeing seahorses, but also for finding out more about them. It’s a way millions of people will come into contact with these creatures that they maybe not really have the opportunity to. But, if you’re in the ocean, I would encourage you to keep your eyes open. … It’s very fun spotting seahorses and seeing them yourself in the wild. There are some countries that are starting to “cash in,” in a good way, on their wild seahorses, and realizing that people will pay good money to go diving or snorkeling and see seahorses. While it’s never a guarantee – they’re wild creatures and can do what they please – there are some places where there is a good chance of seeing them. Places like Bonaire in the Caribbean, have great seahorses. I recently went to Belize, and there were some tours taking people to see the seahorses. You can do this in a sensitive way and not interfere with them too much – don’t touch them and don’t flash lights in their faces. People are coming up with sort of general protocols. Generally treat it as you might imagine it might like to be treated, and they can bring pleasure to so many people and really give value to keeping seahorses alive. I would also encourage anyone who still use them as medicines to think carefully about why they’re using them …[and] to think about alternatives. It’s not a crusade against those traditional medicines at all. It’s just a case of saying, “Be reasonable” about the endangered species they use because there are always alternatives. And, if you can afford a seahorse, because they’re expensive, you can afford to pick an alternative to that seahorse medicine. The seahorse is an icon for everything else in the ocean. For me … they represent the biodiversity of the oceans and the importance of the oceans. ... My point is that we save the seahorses and we save the seas.